Now, that's what I call a dead parrot. A corollary to the idea that I should be knitting (and skiing) at the top ten percent of my ability, is that if I am not killing plants, I am not challenging myself as a gardener. Well, I killed my Meyer lemon tree, so I guess that counts. It isn’t terribly mysterious why, though. Not enough water. 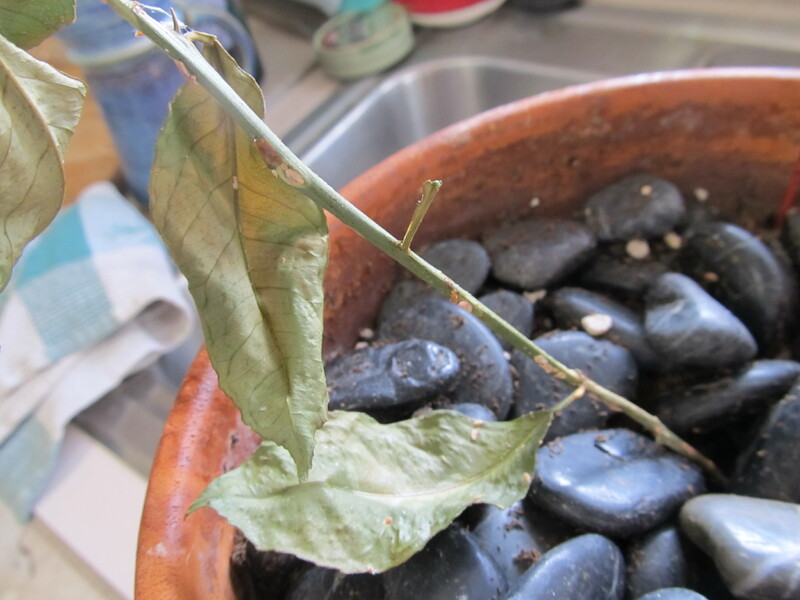 Interesting fact, more houseplants are killed by overwatering than underwatering. Not in my house, you say, well maybe. Usually, overzealous plant owners water too much, which waterlogs the roots. Roots need oxygen, and when they can’t get it, the plant dies. Not in this case, however. The Boy’s room has windows facing south and west, and he is generous enough to let me keep my plants in there- in the winter he lives in the jungle room, essentially. I usually go in there every few weeks with a jug of water and splash everything. Most of the plants are in fairly large ceramic pots, but the Meyer lemon is…was in an 8 inch diameter clay pot. The splash of water every couple of weeks was not enough to keep the soil moist. When I discovered the wilty leaves, I overcompensated by thoroughly soaking it in the kitchen sink. It died anyway. I’ll get another Meyer lemon- try to keep it going. I can’t decide whether I should buy a larger size than what I started with (I paid roughly $10 for a tiny plant in a 2.5 inch pot) so I can just pretend I didn’t lose a year’s growth…what do you think? Previous You do have a compost pile, right? Next Yes, my legs are warm. Why do you ask?